on December 16, 2018 at 3:00 PM. Please join our volunteers in support of the Bakersfield Symphony Orchestra and spread the joy of music to everyone. Music of Bakersfield with Mayor of Bakersfield Karen Goh, Miss Teen Bakersfield Sydney Price, Miss Bakersfield Arlene Carrillo, and Mrs. Bakersfield Julia Kiuftis. Music of Bakersfield volunteers were Pre-Concert Entertainment for the Bakersfield Symphony Orchestra 2018 & 2019 Season Opener on October 6, 2018 at 6:30 PM. The Bakersfield Symphony Orchestra opens the 2018 & 2019 season with a splendid Russian program featuring some of the greatest master composers. The concert begins with a fanfare of the celebratory Festive Overture by Shostakovich followed by Tchaikovsky’s immortal First Piano Concerto played by Daniel Hsu, a brilliant young pianist and prize winner from the Van Cliburn Piano Competition. The program ends with the majestic and humorous Fifth Symphony by Prokofiev. In March 2016, students from Stockdale High School in Bakersfield, California, decided to start volunteering at a local retirement facility. Instead of simply volunteering their time, the students decided to bring their unique talents to serve the seniors. Some sang with them, some danced with them, and one by the name of Isaac Kim played violin for them. After a few months, other students moved on, but Isaac decided to continue and his brother, Ian Kim, a violinist, joined him. Over the years, Isaac and Ian had their friends perform with them from time to time, but they were unable to recruit them in regular bases. However, they did not get discouraged and continued to perform week after week. They especially loved to perform at the Memory Care Unit where most people did not recall seeing them perform the week before, but asked them to come the following week to perform for them. 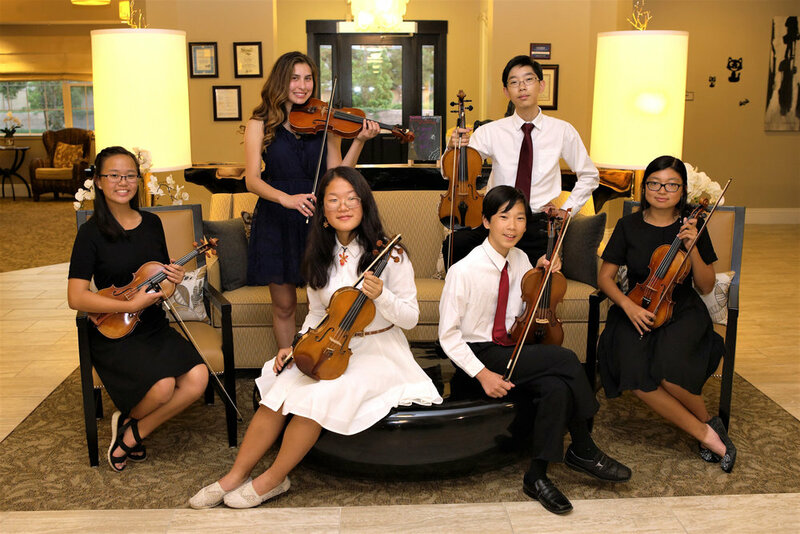 The group did not thrive until 2017, when Christina Xin, Giana Park, Jeannie Yuan, Zaylie Pascillas, Philippe Marinas, and Rachel Pan joined the Kim brothers on a regular basis and Music of Bakersfield was born. In 2018, we have added more volunteers including both elementary and junior high string players. The mission of Music of Bakersfield is to bring young volunteers and senior citizens together through the joy of music. We believe in the healing power of the music and especially love to perform for Alzheimer's and Memory Care patients. Our volunteers are currently performing weekly at three retirement facilities as well as the Alzheimer's Disease Association of Kern County, the Art and Spirituality Center at Mercy Hospital Downtown, and other special events. Through their fundraising effort, seven of our volunteers were able to perform at Carnegie Hall on April 2018. In March of 2018, our volunteers organized Bach In the Subways in the Bakersfield Amtrak Station to increase the public awareness and share the joy of classical music. In summer of 2018, our volunteers started to teach violin to elementary students to inspire the next generation of classic musicians and to sow the seeds for future classical music lovers. Music of Bakersfield and its volunteers have been nominated for the Beautiful Bakersfield Award based on their "outstanding efforts to enhance the quality of life in Bakersfield during 2017". We have performed for weddings, office parties, pre-concert entertainments, and other special events. All proceedings will be used to bring more young people to our organizations and spread the joy of music and bring different generations together. Feel free to contact us and donations will be welcomed. Thank you for dropping by, and we hope you can support us as well as other musical organizations. Music of Bakersfield was nominated for Beautiful Bakersfield Award 2018. Stockdale High School Symphony Orchestra at Carnegie Hall. The Stockdale High School Symphony Orchestra performed in a showcase concert at the New York International Music Festival held at Carnegie Hall on April 24, 2018. Thank to your support and our fundraising effort, seven of volunteers will be performing at this event. Our volunteers, Anna Jian, Isaac and Ian Kim performed for Valley Public Radio Young Artists Spotlight. Music of Bakersfield welcome Daniel and Ella Gove. To celebrate Bach's 333th birthday and spread the joy of classical music, Music of Bakersfield organized an event at Amtrak Station on March 25, 2018. On Valentines Day 2018, Music of Bakersfield Volunteers performed at Bakersfield Breakfast Rotary Club. Music of Bakersfield welcome Rafael Boris, younger brother of Philippe. Music of Bakersfield was nominated for Beautiful Bakersfield Award on June 2018. Thank you San Dimas Medical Group for inviting Music of Bakersfield to perform for their 45th Anniversary Celebration. Thank you Bakersfield Community Concert Association for inviting Music of Bakersfield to be their pre-concert entertainment. Music of Bakersfield welcomes José and Daniel. Music of Bakersfield welcome back Anna Jian. She has performed with us before the organization was formed ans she was instrumental in bringing some of our founding members together. Volunteers from Music of Bakersfield performed at Mercy Hospital Downtown. Thank you Emily Hernandez for arranging this for us. Thanks to San Dimas Medical Group and Mrs. Lynn Del Mundo for letting us perform at San Dimas Medical Group. Music of Bakersfield like to welcome Rachel to our group. Music of Bakersfield was invited to perform for a special event at Rosewood Retirement Community to celebrate and welcome the holiday season. Music of Bakersfield volunteers performed during special Thanksgiving Luncheon at Pacifica Senior Living, Spring Valley, Las Vegas. During Thanksgiving Holiday, Isaac and Ian performed at Acacia Springs Resort Retirement Living & assisted Living Oasis, Las Vegas, Nevada. Just in time for Thanksgiving 2017, Philippe decided to perform with us this week. Our own Isaac Kim was Violin Soloist for The Bakersfield Youth Symphony Orchestra Concert. On October 19, 2017, Music of Bakersfield performed at Stockdale High School Orchestra Fundraiser Dinner and raised fund through Silent Auction. Photo shoot did not turned out as planned. It was like trying to get six cats to cooperate. Music of Bakersfield performing weekly at three retirement facility. 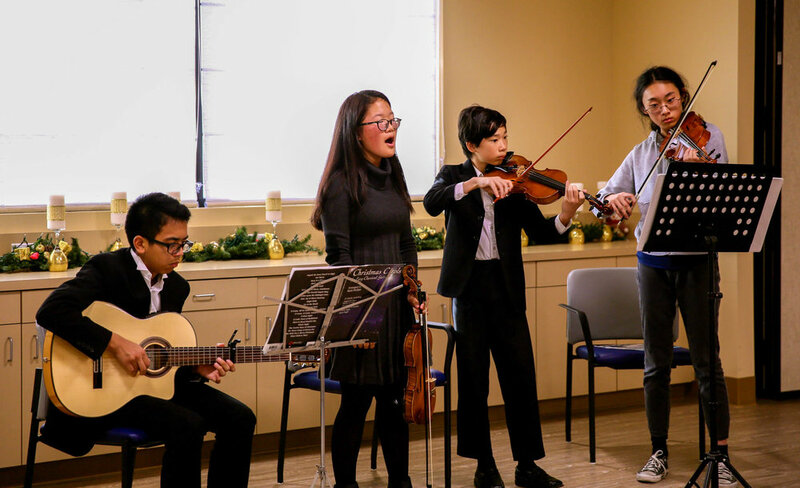 Volunteers from Music of Bakersfield are performing weekly at Brookdale Riverwalk, The Village at Seven Oaks, and Rosewood Retirement Community. Music of Bakersfield is officially a nonprofit organization. Even though we have been performing since March of 2016, we finally decided to make it official.